/ Penny Pincher! Are You Drifting Towards a Scrooge Mentality? Penny Pincher! 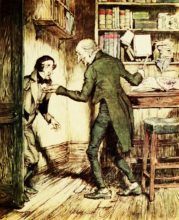 Are You Drifting Towards a Scrooge Mentality? I find that many (possibly most) people attracted to personal finance blogs and books have a focus on saving more than on earning. This may have to do with temperament or how we were raised. There is nothing wrong with this. However, this emphasis on saving money can be self-limiting. An over-emphasis on saving at the expense of earning can be a real barrier to financial independence. Why? Because unless you somehow save millions (like over $5,000,000), financial independence built exclusively on a modest nest egg (say $1,000,000) will be stressful and overly crabbed. Every market downturn will be a cause for worry. This can lead to a scrooge mentality where every dollar you spend makes you nervous or provokes a sense of loss. Let’s not go there. The solution to this is to achieve financial independence, but have skills that you enjoy deploying to still supplement your income. Yes, you can argue that this therefore doesn’t constitute true financial independence. I really don’t care about the semantics. I’m focused on helping people achieve their dreams in a realistic fashion. So don’t just focus on saving money. Focus on building a career that maximizes the return on your time and efforts. BTW, for most people, continuing to work and be productive in some capacity will make them happier anyway. This is why MightyInvestor.com does not just focus on savings and investing. You have to learn to earn in ways that you enjoy.